If you have a cruising boat, you have a PHRF Non-Spinnaker racer or what we’re calling JaM (Jib and Main), because we’re cool. 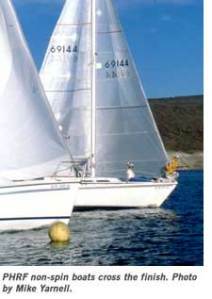 Without a spinnaker, the boats can run with smaller crews (typically 2-3 people). The PHRF handicap system evens up the racing among all kinds of boats, giving you a chance to out-sail the fleet. And because you can “run what you brung,” it’s an ideal place for new racers to discover racing and sharpen sailing skills. This fleet is back in action, with Sharon Bell and Marc Danner sharing the Fleet Captain responsibilities.